It was on 18 August, 1517 that in the Leiden workshop of Jan Severszoon the last sheets were printed of ‘Die cronycke van Hollandt, Zeelandt ende Vrieslant beghinnende van Adams tiden tot die geboerte ons heren Jhesu voertgaende tot den jare MCCCCC ende XVII’ (Chronicle of Holland, Zeeland and Friesland from the time of Adam to the birth of our Lord Jesus and up to the year 1517). The author of this chronicle – which is also known as the ‘Divisiekroniek’, because of its structuring into 32 ‘divisies’ – is not mentioned, but he must be Cornelius Aurelius, one of the first humanists in the Low Countries. He was an Augustinian monk who lived in the monastery Lopsen near Leiden for several years. In that town the historiographer must have met the most important publisher and printer of Holland of that period, Jan Severszoon. The ‘Divisiekroniek’ is one of the largest and most important works printed by Severszoon. Using a variety of medieval sources (and applying some historical criticism) it describes the common past of a region that in those days had become part of the vast Habsburg Empire. On the world map of the Divisiekroniek (which is extant in only a few copies) Holland is but a small spot, within Europe surrounded by many countries, and outside Europe by the continents of Asia, Africa and – recently discovered! – America. By that time printing and publishing had organized itself on an international basis. No wonder that Severszoon requested an imperial patent in Brussels, and that he included the text of the privilege – which prohibited the reprinting of the work during four years – in every copy. The paper and production costs for publishing the ‘Divisiekroniek’ must have been substantial. The work consists of 880 pages and over 300 illustrations, printed from 110 separate woodblocks. Only ten of them were designed specially for the ‘Divisiekroniek’, all the others woodcuts had been used in earlier editions. 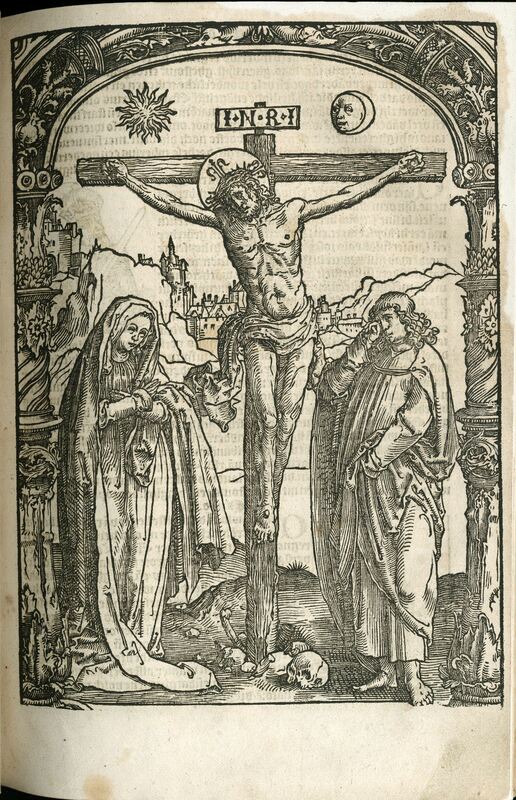 The woodcut with the crucifixion of Christ with Mary and John (f. 38r), a monumental design by fellow townsman Lucas van Leyden, was made for the Missale Trajectense, printed by Severszoon in 1514. Lucas van Leyden is known as the main artist of the Renaissance in the Northern Netherlands, especially by his paintings and prints, but the composition and architectural frame of this woodcut equally show his skills.